Our first balance challenge comes when we try to move from hands and knees to walking upright. While an essential skill, it doesn’t come easily, and we land on our behinds frequently trying to figure it out. After that we try running, usually before we are quite successful at stopping, and often fall forward when we try to stop. Eventually balance on two feet becomes second nature, so we learn to balance on various devices. Bicycles challenge us to remain upright while moving our feet in circles. Roller skates demand that we align two sets of wheels and move only forward, while trying to avoid doing the splits. Ice skates further try our balancing patience trying to glide on two long metal pieces. We rush down ski slopes on two wooden boards. Then we walk over creeks on logs, balance on railroad tracks, and teeter on the tops of walls. We have achieved an amazing array of balancing skills with some patience and perseverance. And then one day late in life we find that something has gone awry. A skill we took for granted–balancing–seems as challenging as it did years ago. We use handrails going down stairs, after wondering for years what they were for. We accept a hand on slippery surfaces. We begin to think about broken bones when we consider ice skating and roller skating. Our bravado about balancing seems to have evaporated. Fortunately, as I wrote a few months ago, there are exercises such as balancing on one foot while brushing our teeth, that restore balance. While I wish I could take balance for granted as I did for so many years, I now concentrate on maintaining it. It’s a lot farther to the ground if I fall now! We do a balance exercise as part of our fitness class: We stand on one foot while tracing the letters of the alphabet in the air with the other. (Air-writing?) It just confirms what I already knew, my strength and balance is much stronger on one side than the other. Guess that means I’ll have to work more on the weak side. My trainer is always insisting that my sides be balanced. I favor one side too. I guess we all do. So we do have to work harder on that other side. Absolutely. People think aging brings more decline than it needs to. 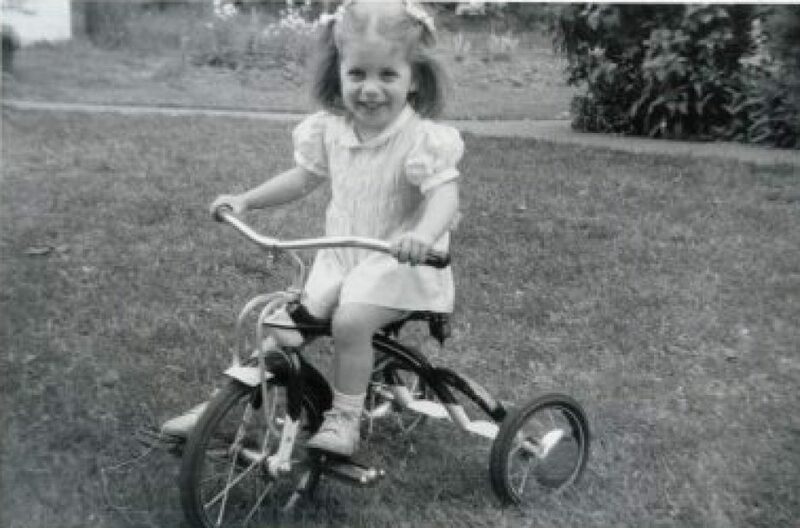 I had a lot of trouble learning to ride a bike, and wasn’t confident on the road until I was 9 years old. But I took to roller skates really quickly, and became adept with them on all surfaces. They were the type that strap over your shoes, called ‘Jacko-Skates’ in England. If you went to fast, the straps got loose, and the skates could fly off. They had rubber brakes on the toes, for when you had to stop fast. That is the same kind of skates I had. They certainly could fly off. Mine didn’t have brakes though, so sometimes I stopped by going onto grass. Watching my daughter’s twins getting to the crawling stage brings it all back. It’ll soon be time to move everything off the coffee tables. Do they crawl forward, backward or sideways? I love all the different ways babies try to move. And wait for one to climb on the table! Did you actually walk on your birthday? Like “ta-da” it’s me. I think you were pretty typical. My grandkids loved boxes more than toys. My mom didn’t think so 😂 I think she was just annoyed that after spending money on toys I still chose the free option. I sympathize with your poor mom never picking up on your preferences and wasting money! The other. I am not sure why. I am working on that skill myself right now. I forgot that we had to learn it once as toddlers.